I found a pattern for a cross stitch of a little elephant off the internet and thought it would be a great idea for my cards. 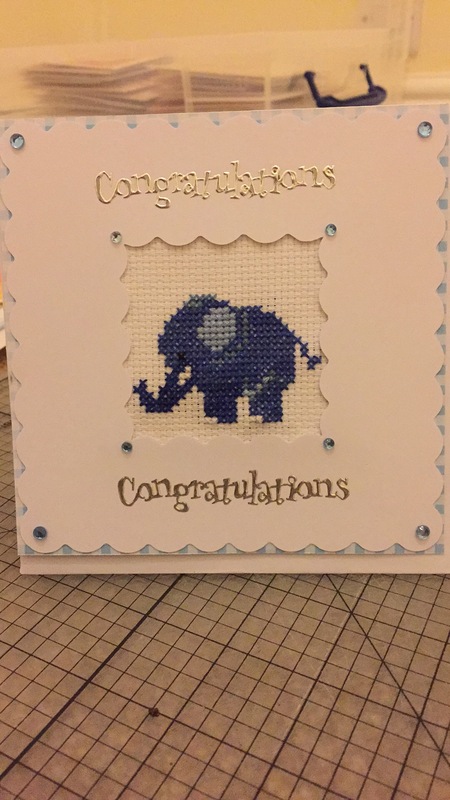 This card is made from high quality White card, (also avaliable in cream) its features an adorable Hand crafted Cross Stitched elephant, with embellishments and wording. A perfect keep sake card for that special bundle of joy. This card is also available in: Pink, Blue, Grey and Yellow. Fully customise option available contact for more details. These cards are made to order exclusively from KimzKardz only. Must allow up to 4 weeks for order.